Why do naturally talented people frequently fail to reach their potential while other far less gifted individuals go on to achieve amazing things? The secret to outstanding achievement is not talent, but a passionate persistence. In other words, grit. MacArthur Genius Award-winning psychologist Angela Duckworth shares fascinating new revelations about who succeeds in life and why. 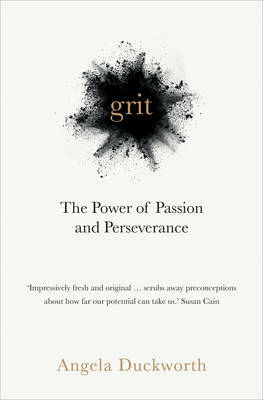 Based on her cutting-edge research, Duckworth shows how many people achieve remarkable things not just by relying on innate natural talent, but by practising what she calls grit. She then offers a Grit Formula to help anyone to become more gritty, focusing on six key factors: hope, effort, precision, passion, ritual and prioritisation. She reveals: why people who test high for talent often fail to achieve their potential, and why people who do not test high for talent often "overachieve" what others expect them to do; how grit can be learned, whatever your IQ or circumstances; why stubbornness is a key characteristic of gritty people; when to be stubborn and when giving up is the grittiest thing you can do; how gritty people found their passion, and you can find yours; how gritty experts practise, and how you can do the same in your own life; what the people who care about you can do to boost your grit when you need it most; how grit is cultivated in the highest-performing sports teams, companies and schools. Leaping past cliches such as 'success is all about hard work', Grit offers a fresh and motivating way to climb to heights far beyond what natural talent would predict.